Ultimate Escapes is gearing up for ski season. With the two new homes that it just opened in Steamboat Springs it has a total of 5 homes across the three different destination club levels. When Ultimate Escapes started back in 2005 (it was named Ultimate Resort at the time) one of its very first homes was in Steamboat Springs. The two new residences include one in the Elite level club (average value $3m homes). This provides 5 bedrooms, a loft, 5 and ½ baths and 3,300 square feet of living space. Each bedroom has its own private bathroom and is decorated with alpine themed furnishings and equipped with flat panel televisions, stereo speakers and ceiling fans. The great room and loft area are large spaces for relaxing around the fireplace, shooting pool or watching movies. The home is just steps from the Steamboat gondola and at the end of the day Ultimate members can relax in their own seven person Hot Springs Spa. The 3,500 sq ft home addition to the Signature level club (average value $2m homes) sleeps up to 12 adults and children in four large bedrooms, each with private bathrooms and large closets. The great room features a massive stone fireplace, 25-foot ceilings and large floor-to-ceiling windows - providing spectacular views of the mountain ski slopes. The Signature level club now has three homes in Steamboat and there is also one home in Ultimate Escapes Premiere level club (average value $1m homes). 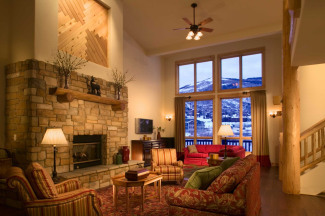 As you might imagine for a popular ski resort in Colorado, there are several other destination clubs and private residence clubs in Steamboat. You can see the list in our Steamboat Springs home listings.